Wedding planning is certainly underway! And I'm not going to lie, my head is certainly spinning! From enjoying the first moments of being an engaged couple, to the next steps of planning a wedding, it's easy to get overwhelmed. As a Frugalista, my main thought has been "Gosh, this is expensive!" From the cost of flowers, to the hidden costs of silverwear, the dollar signs keep adding up! As a fashionista, one of my first thoughts was of course, my dress! As most girls do, I've been pinning wedding dress ideas on Pinterest since it was invented! No joke. Haha. My taste and style has evolved over the years, but my desire for something unique and romantic has stayed the same. Having a distinct look in mind, I was afraid of the price tag that might be attached. Being a frugal chic, I told myself I didn't want to spend more than $1,000, which if you know anything about wedding dresses, is NOT a lot. Afraid of having to step outside my budget, I started researching other options and creative ways to save on designer gowns. I decided to make a blog post about some of the best options and tips I found to help frugal brides during their wedding gown search! 1. Find a bridal boutique that sells designer gown samples! Every bridal boutique features sample gowns for brides to try on when deciding upon their big purchase. Many times boutiques will sell their samples on certain occasions. If you live in NYC, like I do ;), you are lucky enough to live in sample sale heaven! Many wedding gown designers headquarters are in NYC and they have sample sales and trunk shows all the time, when you can find gorgegous gowns at a discounted price. Another great find are bridal boutiques that are soley full of sample gowns that come straight from designers! In the NYC-Metro area, there are quite a few! 2. Shop bridal consignment shops! An even more common option then bridal sample gown boutiques are bridal consignment stores. These are very similar to your normal consignment shops, but they only consign bridal gowns! Most shops are very selective about their inventory and only select high end gowns that show minimal to no wear. Even though these may be worn before, you can never tell! If you're into designer gowns, but not the hefty price tag, this might be the path for you. Especially in urban areas, like NYC, where there are lots of used designer gowns floating around, you can hit the jackpot. Many times bridal consignments offer a wide variety of price ranges as well. So no matter what you're budget, you can find a gown that you love. 3. Shop on preowned wedding gown sites! Before becoming a bride myself, I never knew these existed! There are so many websites that exist just as a platform for brides to sell their gowns. On the most popular sites, you can search by size, designer, style, and price range. You may even be able to search by region, so you can try the dress on before the big purchase! The biggest pitfall with buying a dress online is the inability to try it on before purchasing. If you find a style you love, you can always search for a similar style, or the exact dress, at a local bridal boutique to see if you really love it. Now to hear the story of my gown! I ended up finding my gown on the first shot! Of course as a Frugalista, I was researching consignment bridal shops in NYC and came across Bridal Garden. My interest was immediately peaked when learning that most of their pieces come directly from designers in NYC. Then I found out that the store is actually a non-profit who donates most of their profits to disadvantaged kids in the city! How cool is that!? I immediately made an appointment, with the intent of getting a feel for what I like and price ranges. I never thought I would walk away with a gown! I brought one friend along and it ended up being a wonderful experience! We had free reign in the boutique, with no time limit or dress limit. I literally went through every dress in my size range and picked out every single dress I would be remotely interested in. I ended up trying on such a wide variety of dresses, from long sleeves to off-the-shoulder! In the end I found a dress I loved, that literally embodied everything I wanted in a gown. It even looked exactly like a dress I pinned on Pinterest! 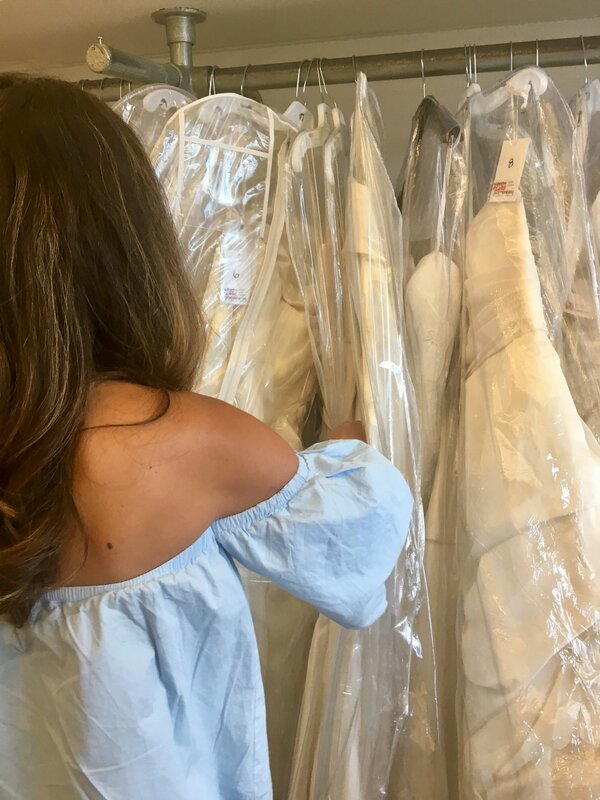 My wedding dress shopping experience, wasn't the experience that I had imagined, so I was kind of hesitant to take the plunge right away. When the associate told me my dress was on sale for $599, I knew I couldn't pass it up! I was sold! In the end I walked away with a several thousand dollar dress for less than $700. A Frugalista's dream! Planning a wedding on a budget is not an easy fete, but step by step I'm finding my way. :) And I feel like this wedding gown steal is a great start!